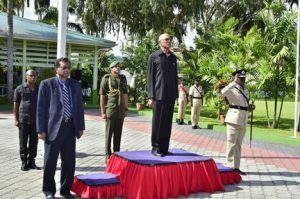 Noting that a corrupt police force cannot guarantee the security of its citizens, President David Granger yesterday told the Force’s senior ranks that they will be held accountable if they are found to be untrustworthy. Granger issued the warning while addressing participants at the opening of Police Force’s Annual Officers’ Conference. The event was held at State House for the first time and the Head of State, undergoing chemotherapy while facing the prospect of early elections, quipped that the ranks will see him again in the next year. 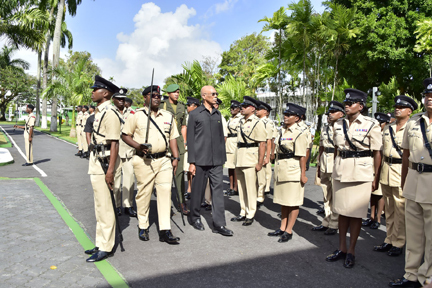 Describing 2019 as “a special year for the Guyana Police Force, which is celebrating its 180th year in existence, Granger said that the safety of citizens and the security of the state, and stability of the economy are of paramount concern to the Government. Emphasizing his commitment to security sector reform, the Head of State noted that Government resuscitated the Police Service Commission and the Police Complaints Authority last year. “Security sector reform is being pursued, it is expected that the reforms will be carried out with the aim of restoring public trust in the Force, reinforcing the Force’s capability to fight crime and promoting men and women only of the highest integrity to become officers,” Granger said. “The PSC in particular has a role to play with its independent status in enhancing public trust in the Force, and boosting the morale of officers…. “The principles of merit, the principles of discipline; these principles, if applied fairly can encourage probity and discourage misconduct. “The Commission’s support for the objective of security sector reform can ensure that there will be within the Force a corps of senior officers who are committed to effective police administration, operation, investigation and intelligence gathering, to ensuring sound leadership of subordinate officers and constables and …being capable of ensuring public trust. The head of state also noted the challenges that the Force faces, with its shortage of ranks and equipment. “The force’s membership of about 4,600 is inadequate and needs to be augmented. Our country of over 215,000 square kilometers–larger than England and Scotland combined– is challenged to maintain security everywhere. These geographical and demographical factors place a burden on the Force’s organisational and administration capabilities. Officers in this regard are selected, trained , promoted and tasked to command the Force’s manpower and manage its resources in this varied landscape. Commissioner James noted that last year, he joined with his four deputies and visited all the police locations countrywide. He also spoke of an eleven percent decline in serious crimes in 2019. We will remain resolute and focused in our ideals as our mandate is very clear. Public security will be maintained. He added that last year’s Local Government Elections were incident-free. The conference ends on Saturday. Preparation for early General Elections is likely to be one of the key issues that will be discussed.